Estonia is the 12th EU country I've visited since 24 June 2016, in addition to trips to Norway and Iceland. I've been to most of these countries before, but my Euro-philic sensibilities have also encouraged me to venture into EU pastures new — and to hope that these visits don't turn into a EU-logy. 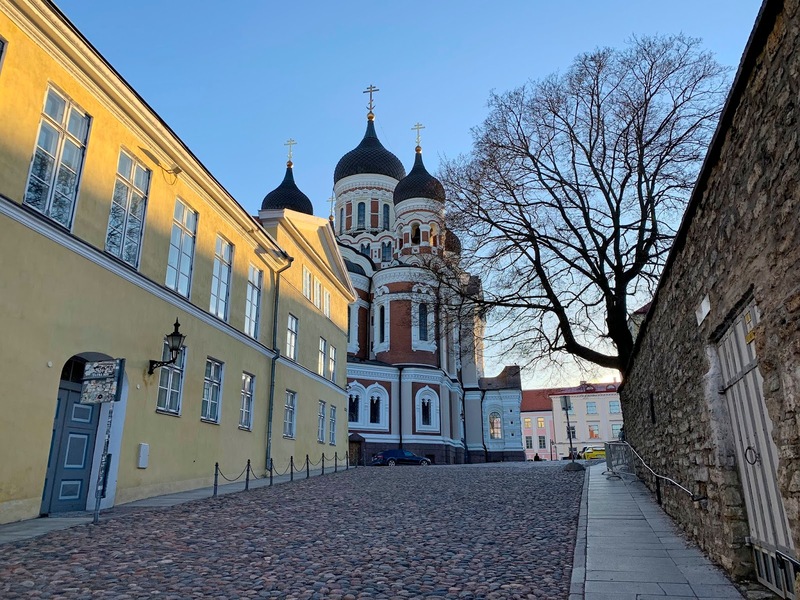 I'd been meaning to visit Tallinn for some time and was able to book BA flights, including an outbound leg in business class, for a good price during the Christmas sale. 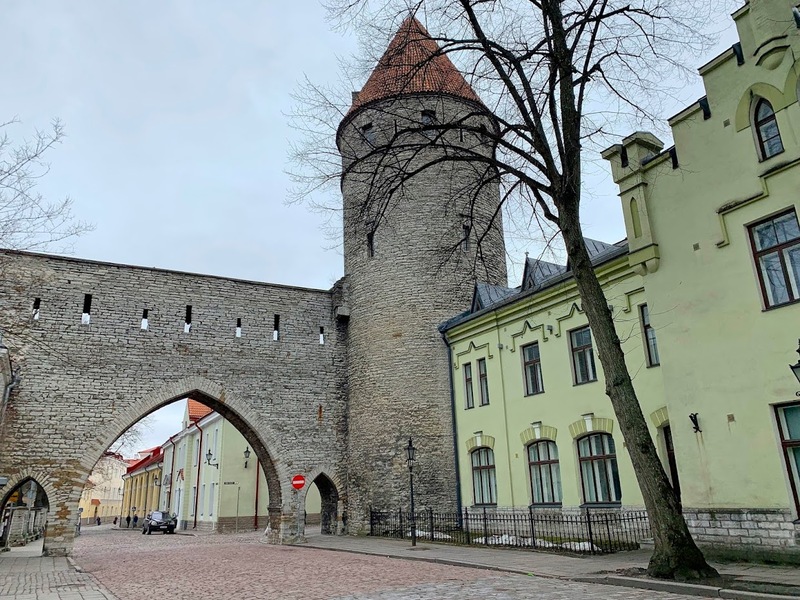 Located just 50 miles south of Helsinki across the Gulf of Finland, Tallinn is a compact capital city whose pretty Old Town is one of the best preserved Mediaeval cities in Europe. I spent a weekend there, flying in late on Friday afternoon and heading home (via a short hop to Helsinki) on Sunday evening, which was a good amount of time for a first visit. 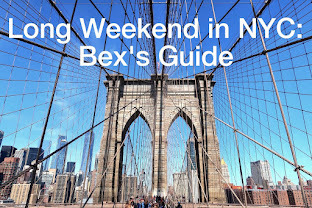 I'd feared my late March visit might translate into terrible weather, so I tried to plan for some indoor activities too, but I was lucky and it was cold but mostly sunny, with a short period of rain on Saturday. 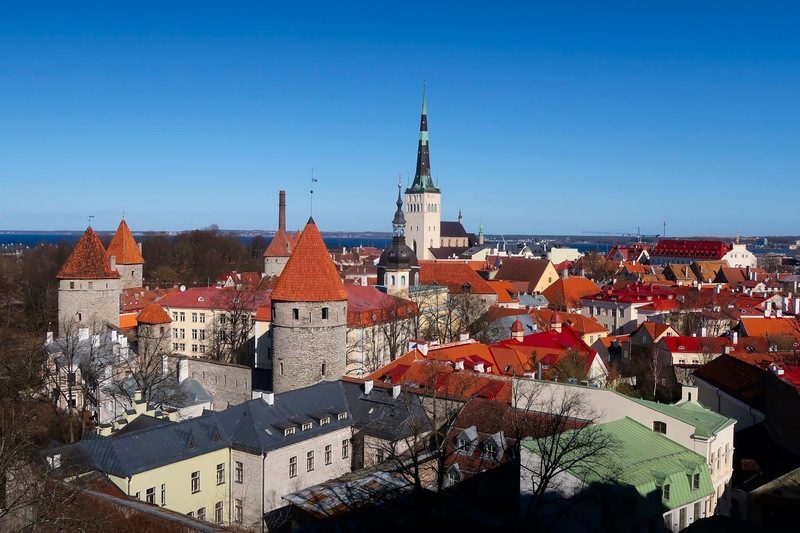 Inevitably, Tallinn is extremely busy in July and August, but much calmer in the earliest days of spring. Exploring the Old Town. 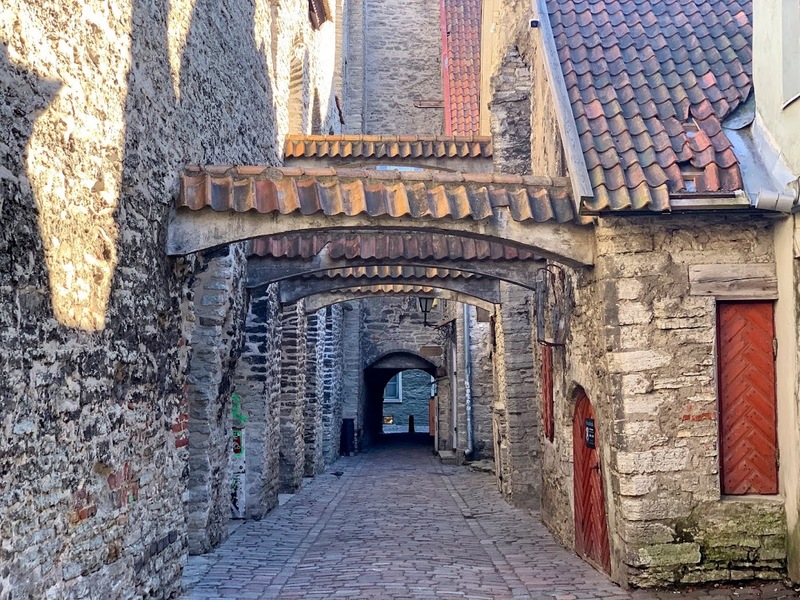 With its often steep, labyrinthine streets and fairytale-ready pastel-hued architecture, Tallinn's Old Town is a great place for sightseeing. I arrived in time for golden hour and immediately dashed out of my hotel, chasing the gorgeous light. 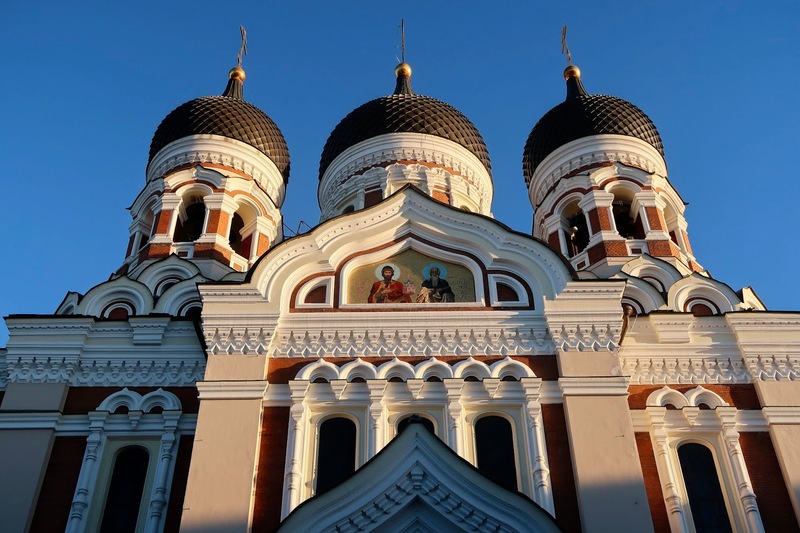 The domes of the Alexander Nevsky Cathedral looked particularly fetching as they caught the evening light. There are two viewing platforms where you can take photos of the classic red-rooftops-of-Tallinn view: Patkuli lookout, which faces north towards the Baltic, and Kohtuotsa lookout, which looks out over the Old Town to the east. 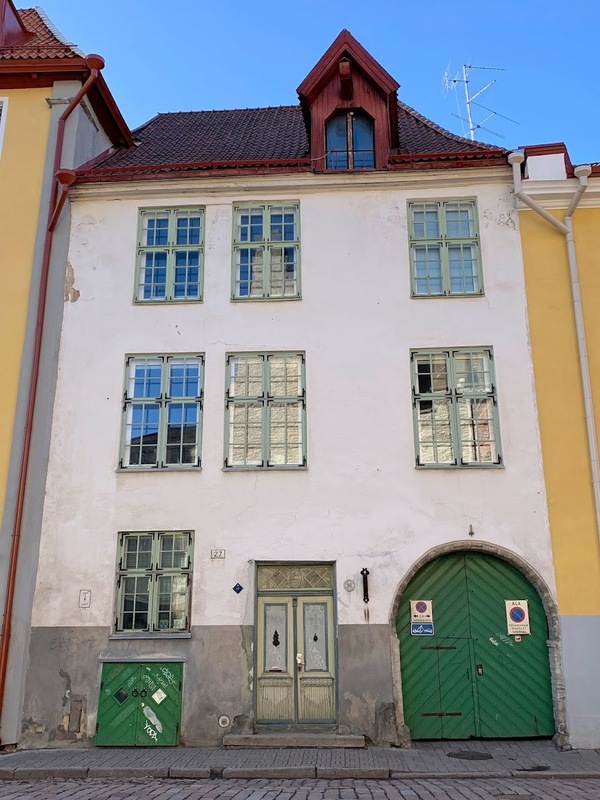 As usual, I brought a Lonely Planet guidebook, which included a two-hour walking route through the Old Town, journeying through various city gates, and past the Toompea Castle, the former KGB quarters and the city's diverse guilds. 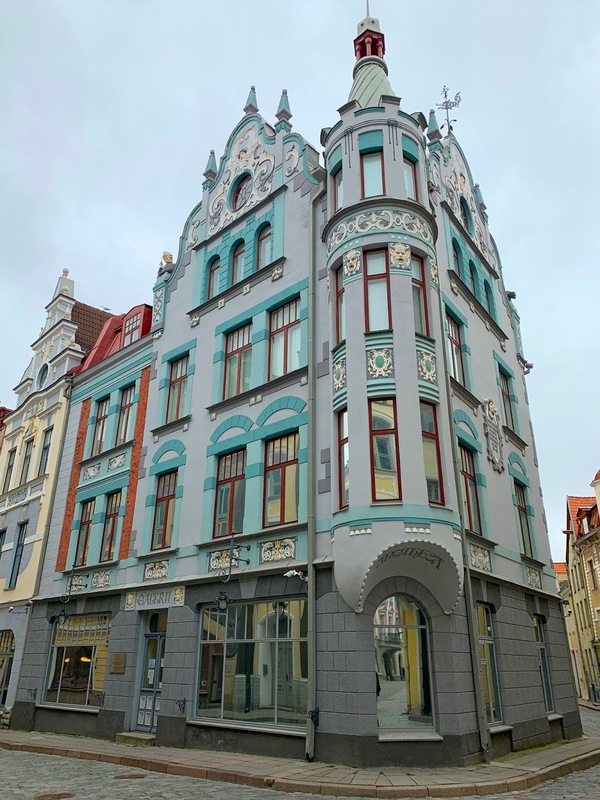 Tallinn City Museum. Keen for more history and culture — and to avoid the rain — I ducked inside the main branch of the Tallinn City Museum on Vene Street. 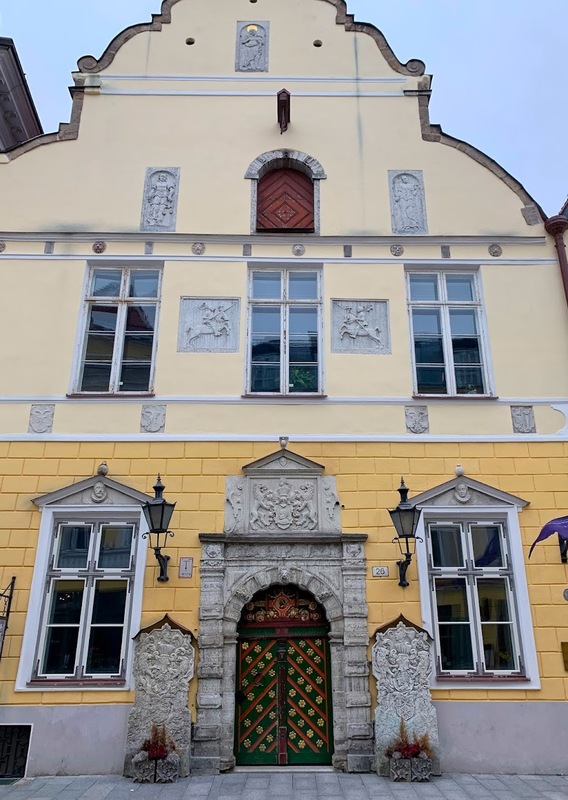 I spent a diverting hour in the small museum, which combines history of the city — both back to its formal establishment in the 13th century, and more recent 20th century history. Upstairs, a collection of Langebraun porcelain was on display, which did not help to dispel my ceramic cravings. Kadriorg Park. 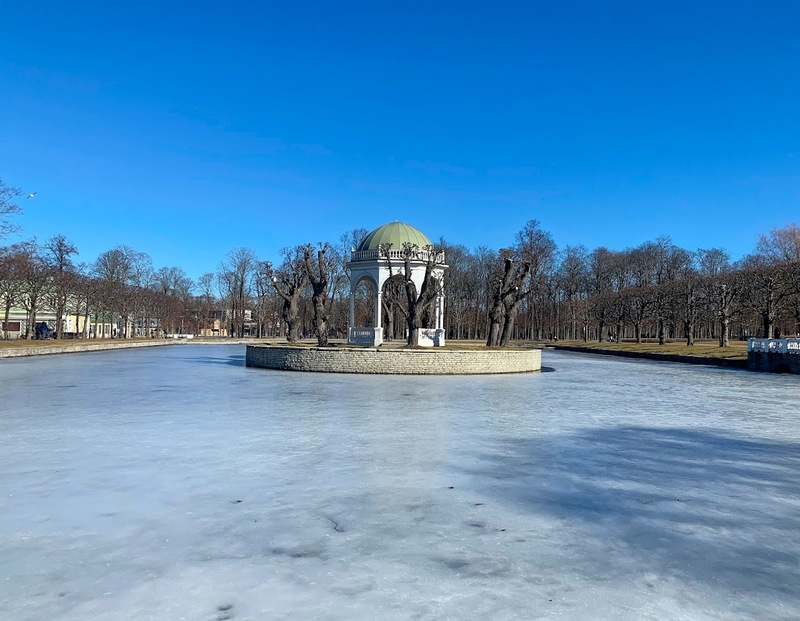 On Sunday morning, the sun came out again and I decided to walk out to the Kadriorg district, 1.5 miles east of the Old Town. Even during the earliest days of spring — and with the weather still wintry — the large park was on fine form, and many families were out and about, enjoying the sunshine. 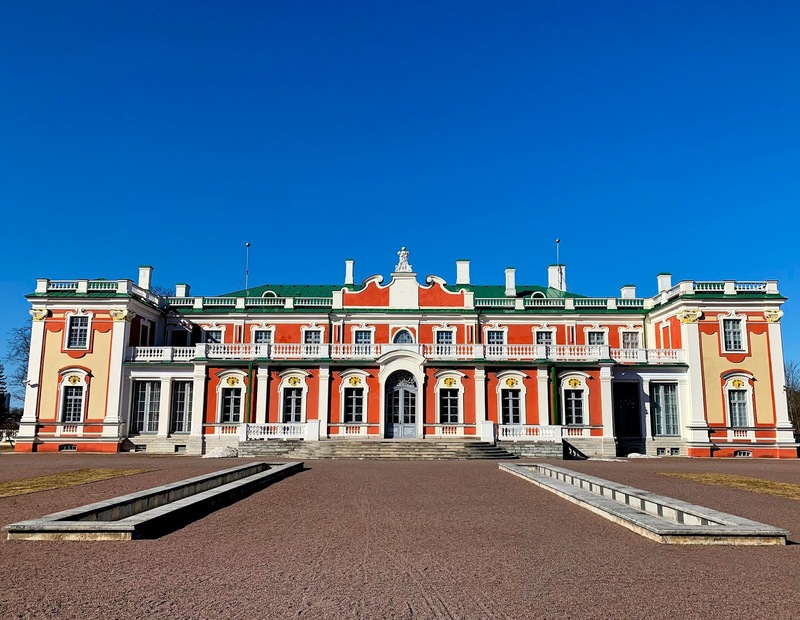 The colourful, baroque Kadriorg Palace was built for Catherine I of Russia by Peter the Great, but is now home to Kadriorg Art Museum. 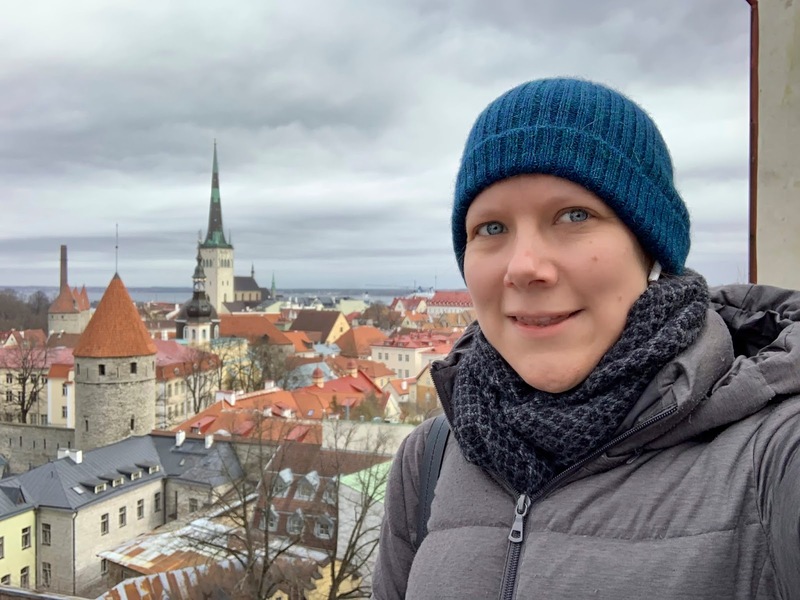 Unsurprisingly, I spent a lot of my time in Tallinn enjoying the local food and drink. 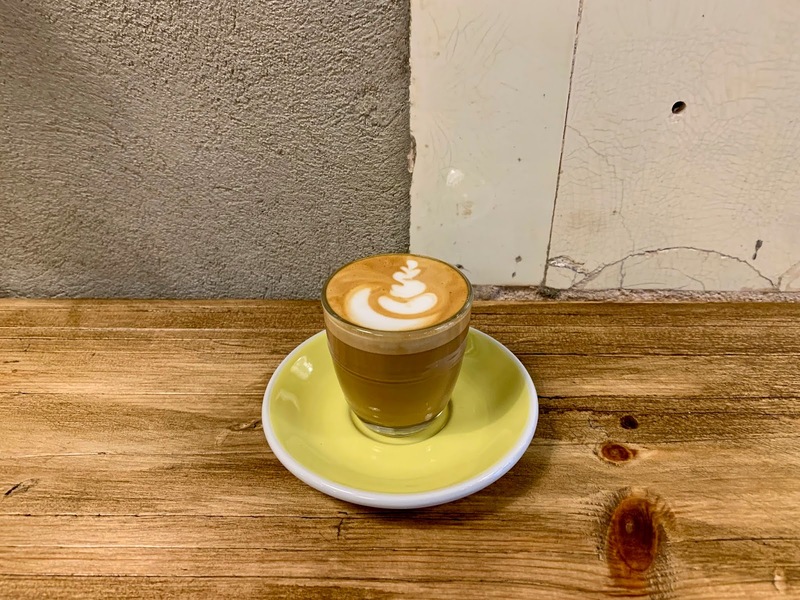 I've already written about my speciality coffee experiences in Tallinn, but you'll have to read on to find out how I ended up having two multi-course tasting menu meals in one day. 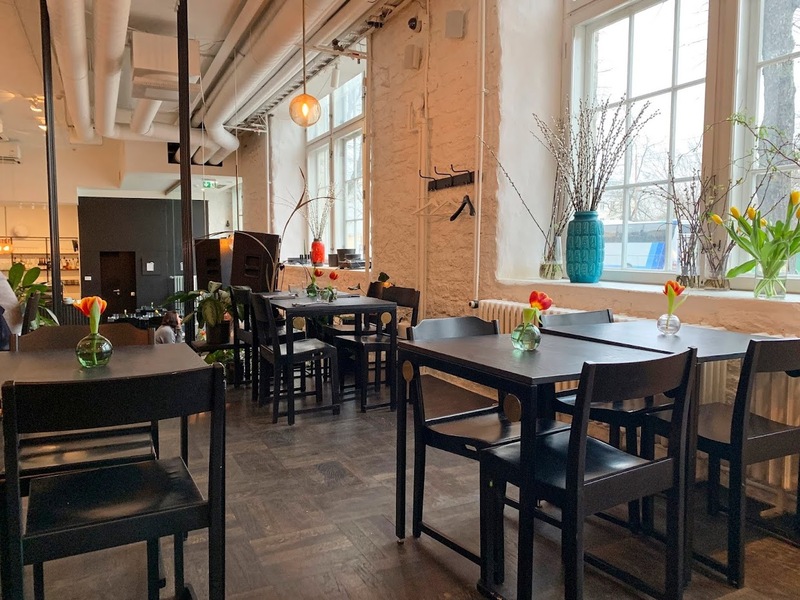 For breakfast or a casual brunch, I would recommend RØST for pastries and T35 for larger dishes; both of these cafes also serve very good coffee. 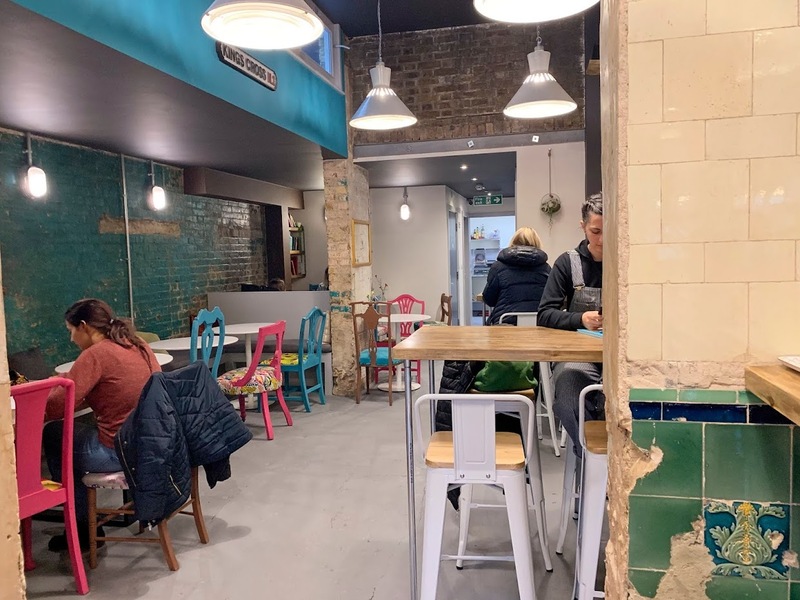 I was out of meals, but the Balti Jaama Turg (Baltic Station Market) is a great place for (indoor) street food bites. Baojaam — serving Taiwanese bao — is highly recommended. 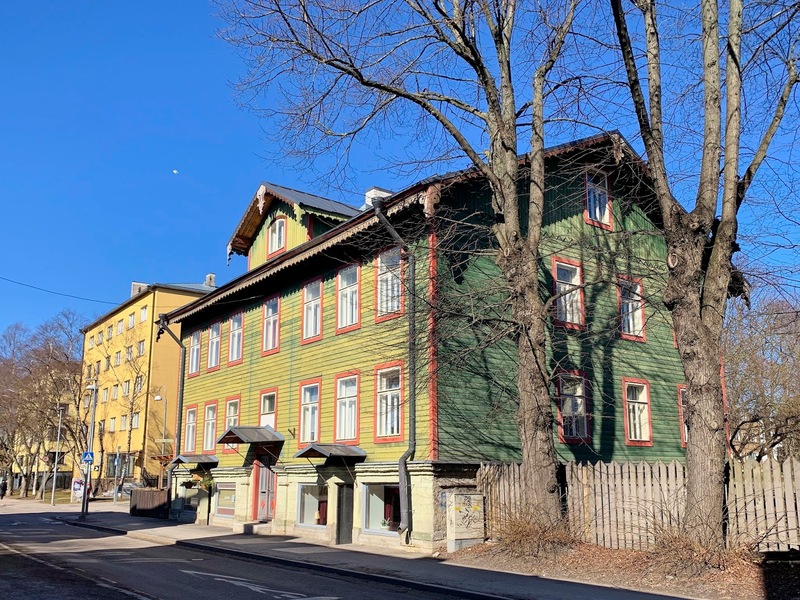 I visited Trühvel and Sfäär for their umlauts, for their coffee and their food. 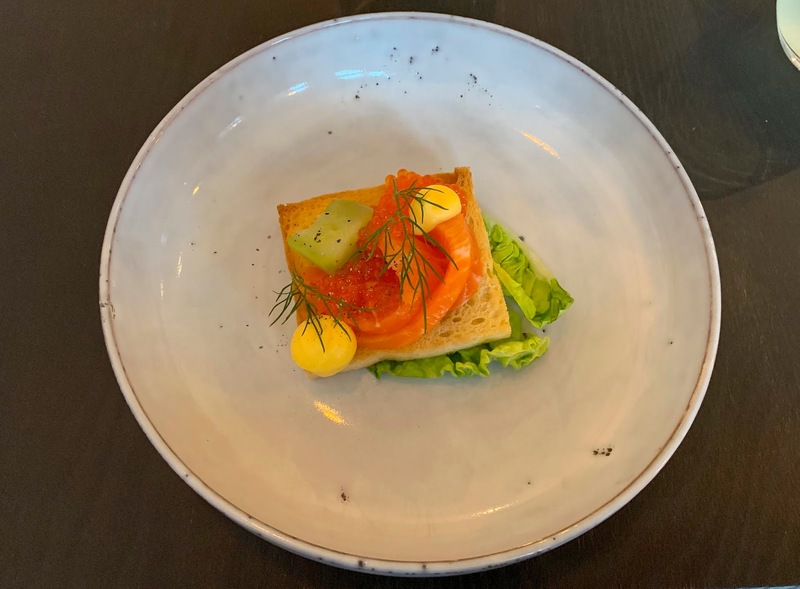 At Trühvel, a contemporary Mediterranean restaurant in the Telliskivi district, my cocktail and roast chicken were both delicious, but I was most excited about the garlic bread: a small rye loaf that contained about 50% roasted garlic cloves, 20% bacon and 10% cheese. I was cleaning my teeth every few hours for the rest of the weekend but it was so worth it. I had heard good things about the Saturday brunch menu at Sfäär, and when I turned up to the stylish, minimalist restaurant in the Rotermann Quarter, I pointed to the menu item I wanted to order. It turned out, however, that brunch was a six-course affair for €22. Although I had already booked another tasting menu for the evening, I somehow couldn't say no. The six courses included Estonian foods and dishes with a contemporary, creative twist. My favourites were the salted trout and trout roe on crispy bread, and the bulgogi beef. Restoran Ö is an ode to the ö, a letter which is used frequently on Saaremaa, the island from whence the restaurant's owners hail. 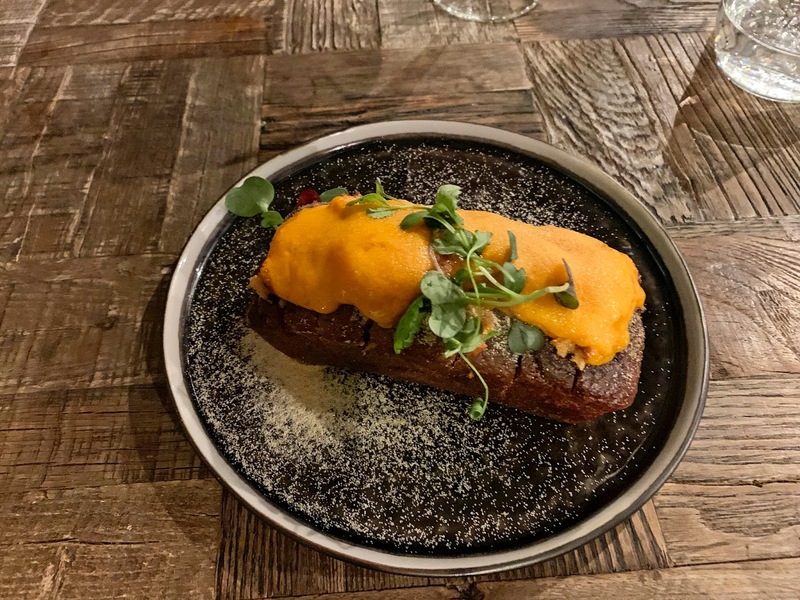 The menu consists of either the taste journey (five courses plus nibbles and candy) for €59 or the taste exploration (nine courses plus nibbles and candy) for €76. 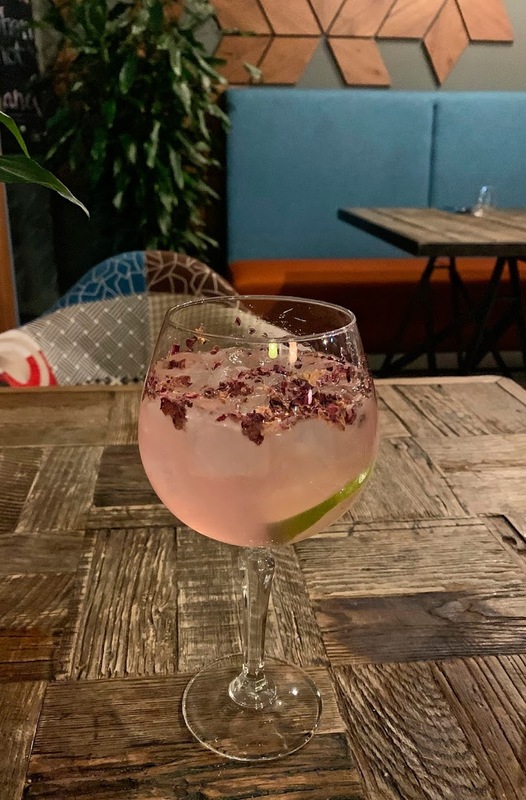 Given my earlier indulgence, I opted for the latter, choosing a Crafter's Gin Collins to accompany my meal rather than the drinks pairings. 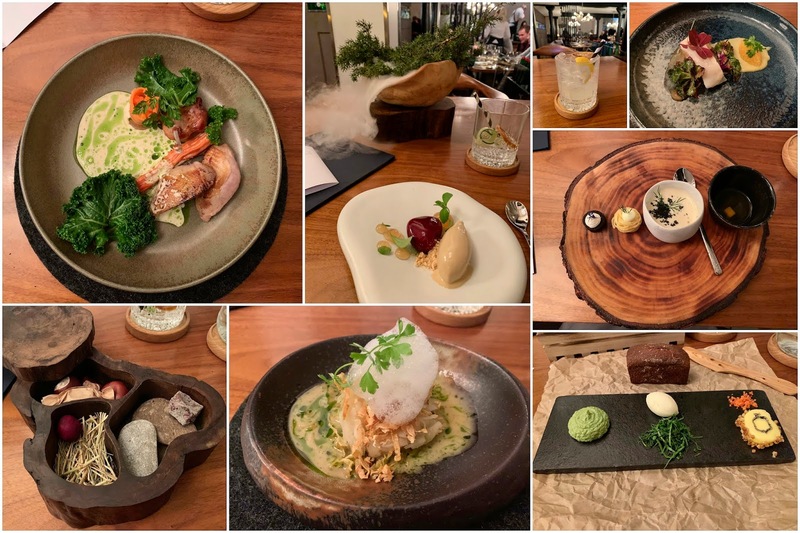 Each dish was exquisitely prepared and beautifully presented, and the wait staff provided just the right level of detail about each dish, along with a very warm welcome. Although I enjoyed the perch pike and quail, the celebration of celery ended up being one of my favourite dishes with roasted and grated celery accompanying celery foam — oh, with a little caramelised butter to keep things interesting. The dessert was also an Estonian classic: a malted caramel beer ice cream, served with curds enrobed in a berry glaze, hazelnut, and tomato beer gel. While I ate this dish, a branch of fir was brought to the table and turned into a sort of diffuser, filling the air with fir-scented mist. And just in case I hadn't had enough garlic, one of the 'candies' was a chocolate and black garlic caramel; yum! 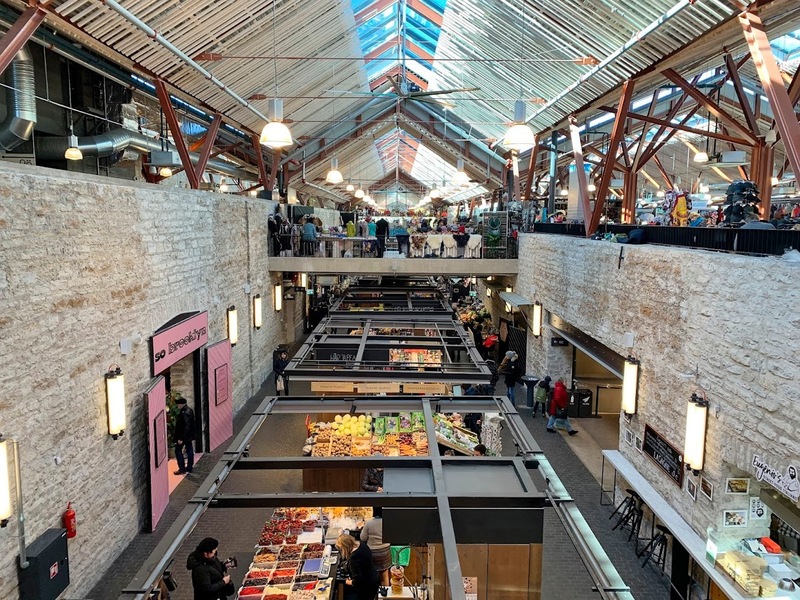 I didn't do much shopping in Tallinn but I wanted to highlight a few of the shops I liked. 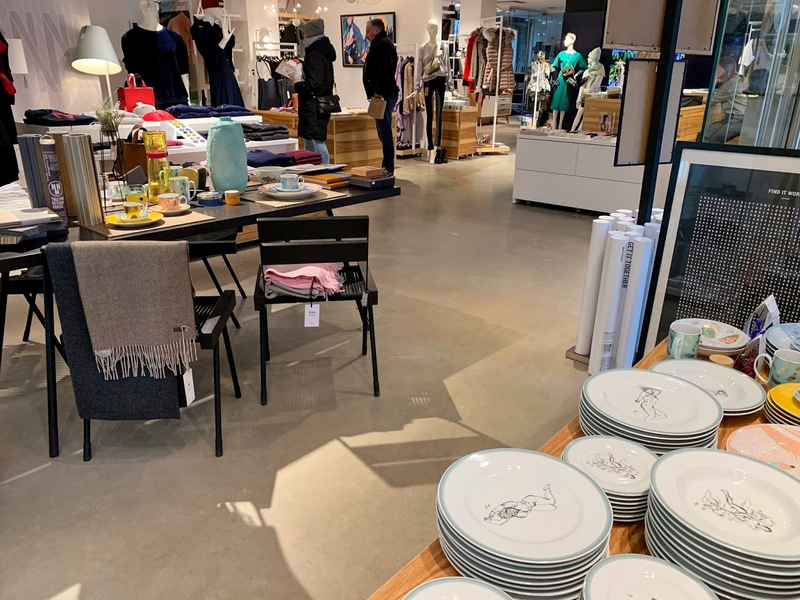 Estonian Design House, inside the Solaris shopping centre, and Tallinn Design House, in the Rotermann Quarter, both have a great range of lifestyle goods and homewares, jewellery and accessories. 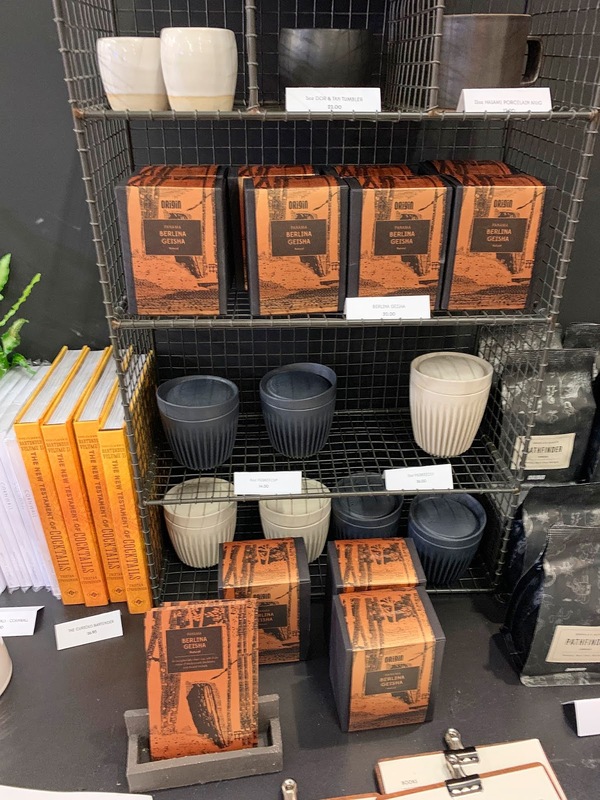 Oma Asi, in the Old Town, also sells homewares and gifts with a focus on locally designed and produced products. I bought a turquoise leather pouch and a wolf pin badge for my mum — there was a lot of wolf iconography in Tallinn, and Wolves are my family's football team. Over in Katariina Käik (St Catherine's Passage), you can find craft workshops selling a variety of traditional goods. 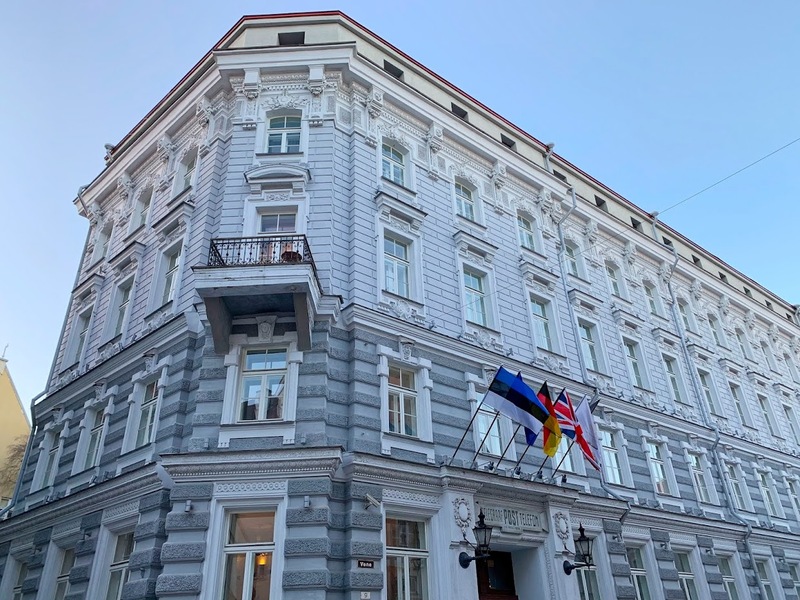 Accommodation: I stayed at the Hotel Telegraaf in the heart of the Old Town. 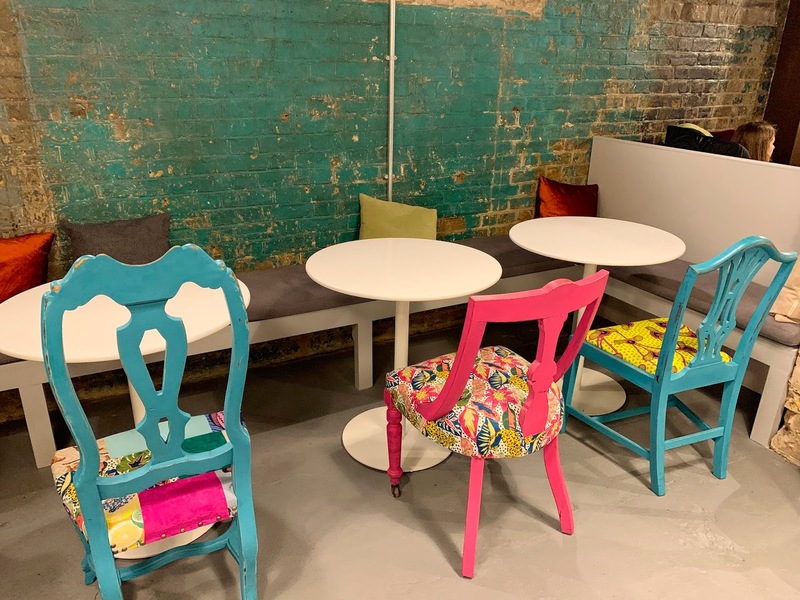 The grand building on Vene Street was once the central post office and in a nod to its history, there are vintage telephones around the building. 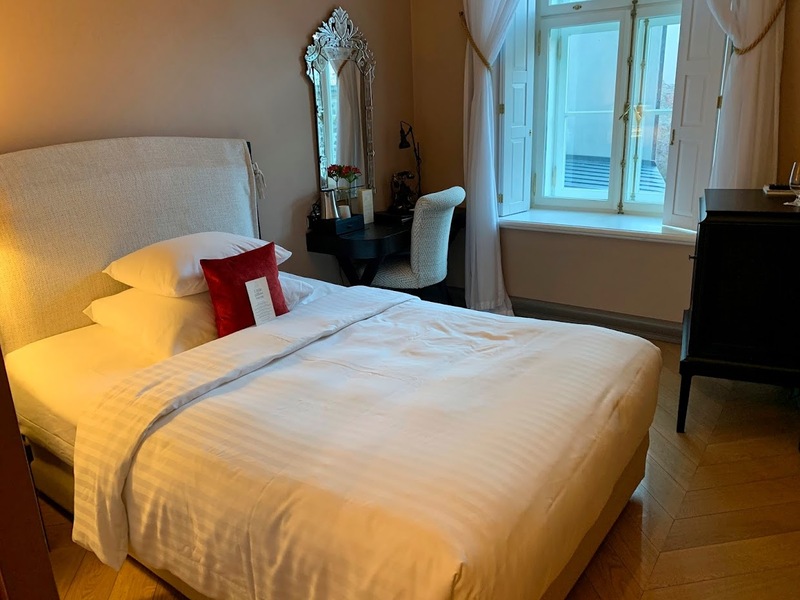 I had one of the smaller rooms (€124 per night), which was quiet and comfortable. 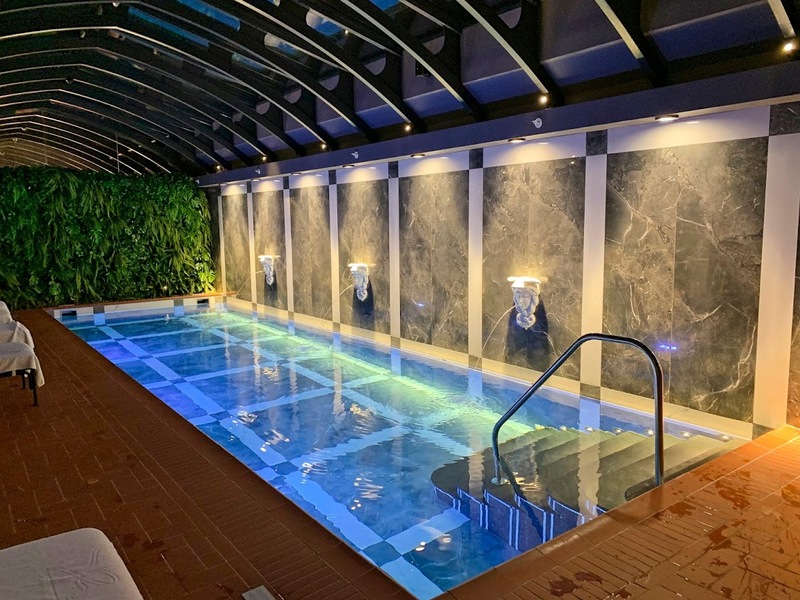 The hotel also has a small but beautiful spa, and I spent a little time relaxing — and warming up — in the jacuzzi, steam room and sauna before dinner each evening. Arriving and getting around: Thanks to a fast (20 minutes) and cheap (€1) tram, the journey from the airport to the Old Town is extremely convenient. I stepped off the plane at 4:50 pm and was at my hotel 35 minutes later. You can pay your tram fare with cash or use your contactless card (you'll need to use the reader near the front of the tram; some of the readers only accept local travel cards). Other than my trips to and from the airport, I didn't use any form of transport, but there are various trams and buses in case you don't fancy the stroll out to areas like Kadriorg. Money: Estonia uses the Euro and everywhere I went accepted credit card payments. In fact, I only used cash for tips on a couple of occasions when I didn't have the option to add a tip to the card payment. Most of the venues I visited accepted contactless payments too. 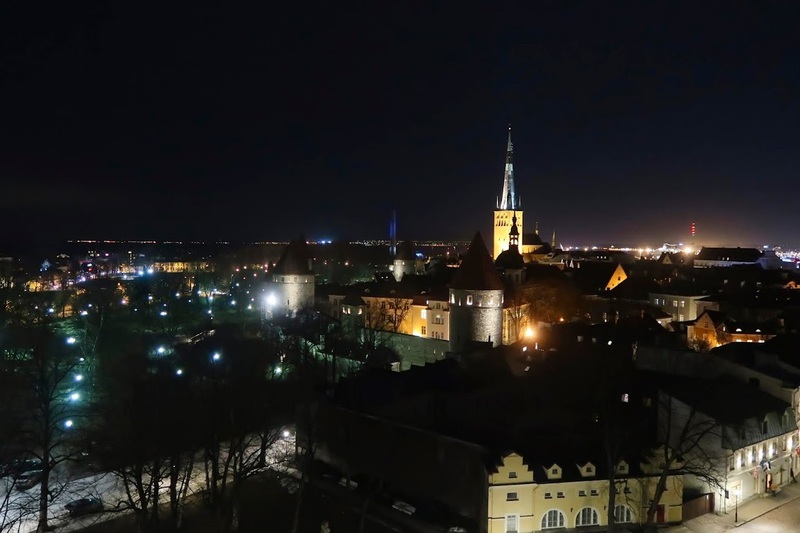 This is perhaps unsurprising given Tallinn's reputation as a tech hub. 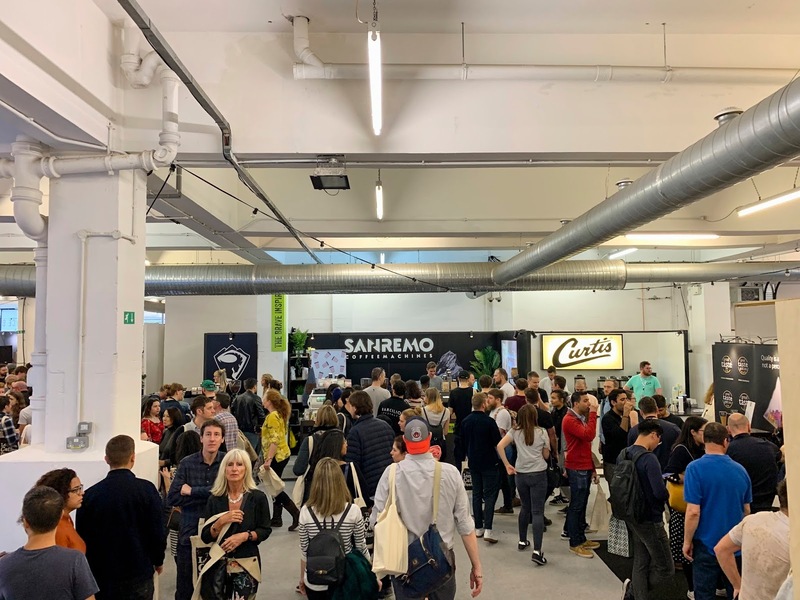 This year's London Coffee Festival took place last weekend, a four-day event taking place at the Old Truman Brewery in Spitalfields. Once again, I couldn't get out of the office to attend one of the two industry days (Thursday and Friday) but I spent all day Saturday, the first full public day, at the festival, taking full advantage of all that it had to offer. 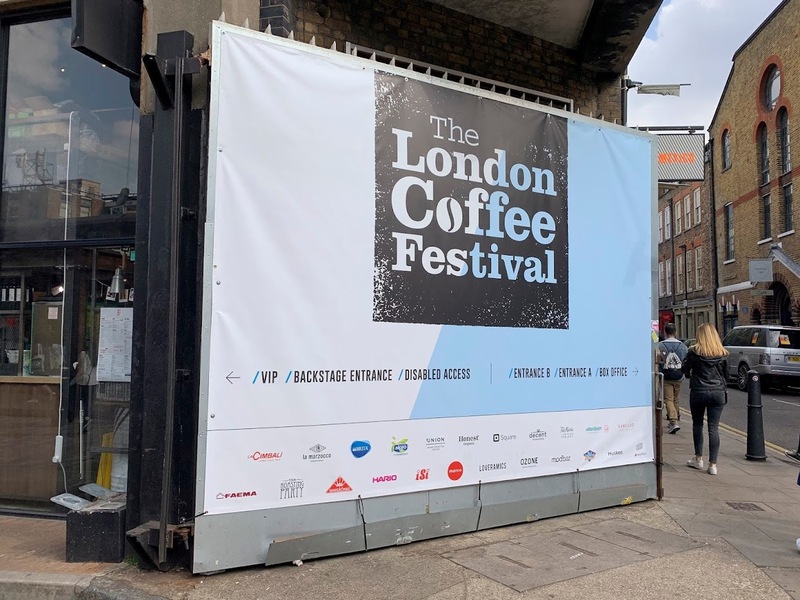 I was granted a full-day press pass (thank you to London Coffee Festival and Hope & Glory), which meant I could take my time exploring. Although the venue was the same as in previous years, it always takes me a couple of hours to get my bearings for all four floors. As always, I recommend that coffee geeks book more than one three-hour session — or a VIP ticket, which provides fast-track entry and all-day access, so you have enough time to see and do everything. 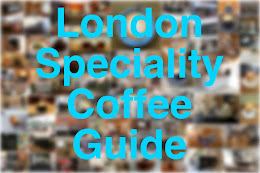 VIP tickets also include a copy of The London Coffee Guide and a coffee cocktail. There's a VIP lounge too, but there's not much to do there. 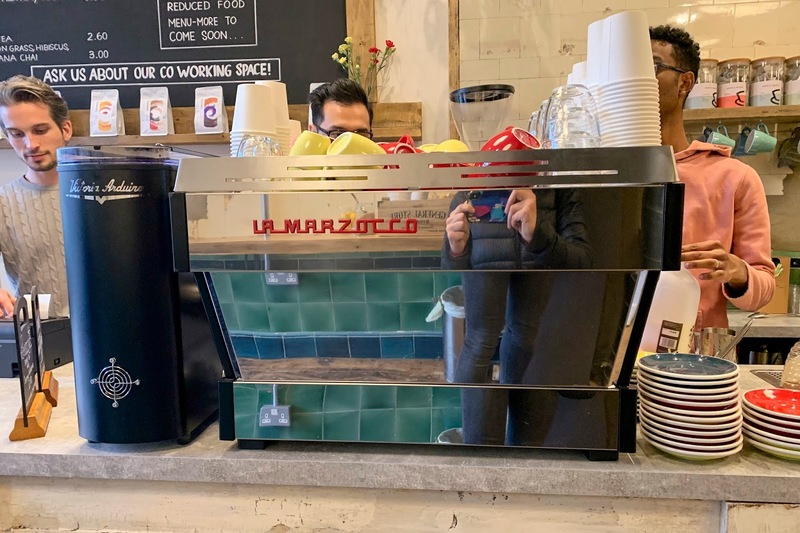 As in previous years, I've divided my review into three sections: coffee, experiences and kit. 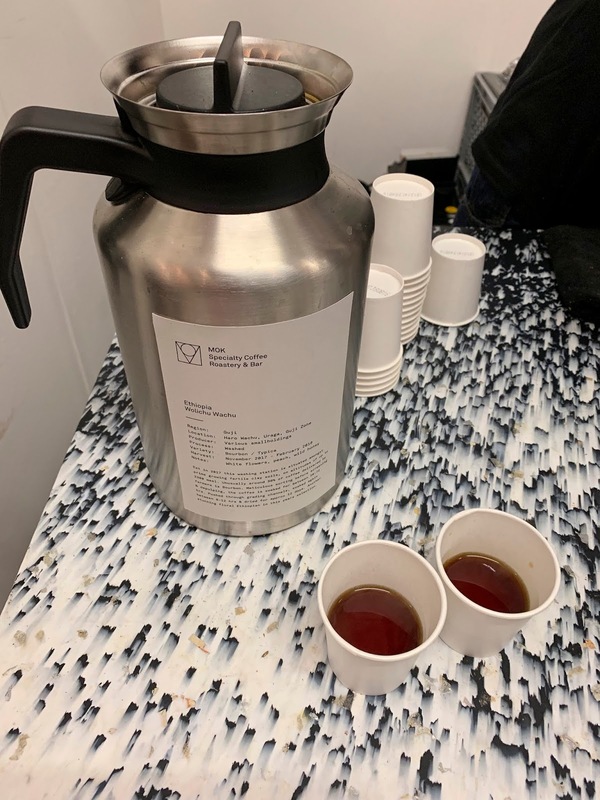 The main reason I attend the festival each year is to catch up with roaster friends and to try out new or new-to-me roasters. Although I was only there for a day — and did miss a few of the roasters I'd been hoping to visit — I didn't do too badly with this objective. 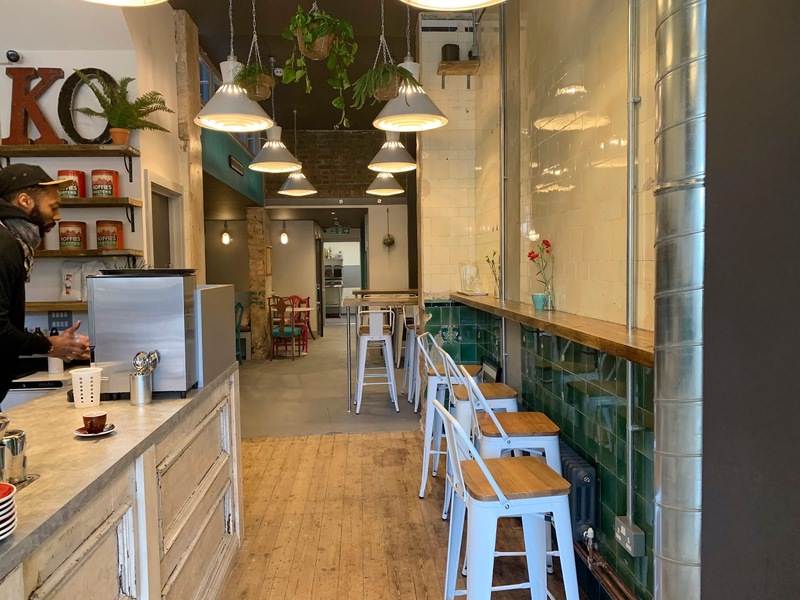 Belfast-based roaster Bailies has been on my radar for a long time, so I was pleased that after a quick recce, their stand was one of the first I came across. 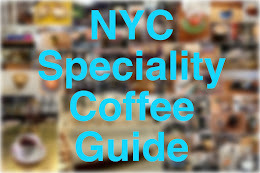 I tried three coffees: a Panamanian natural Gesha, a Guatemalan natural maragogype, and an experimental Costa Rican lot. 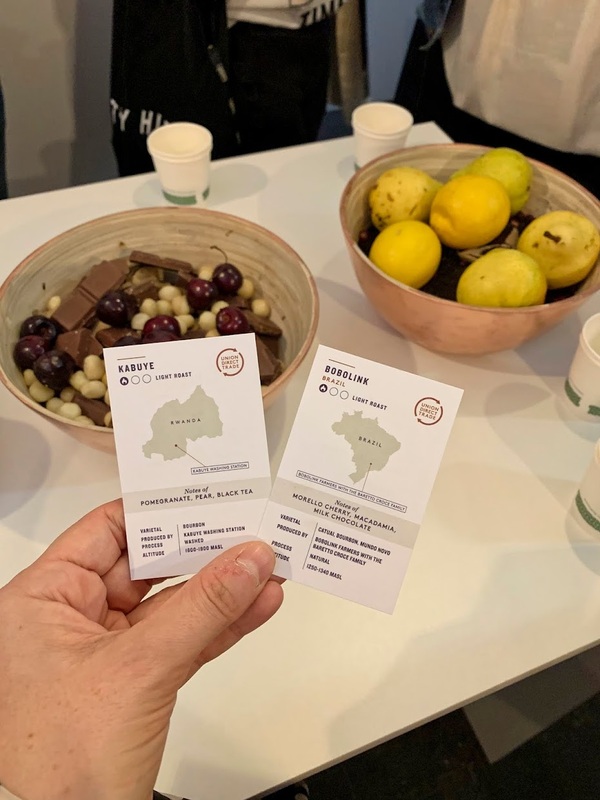 The first two were particularly impressive and although I hadn't planned to buy any beans, I bought a 100g bag of the Guatemalan coffee, which was entered in this year's Cup of Excellence. Bailies' packaging is right up my street too. 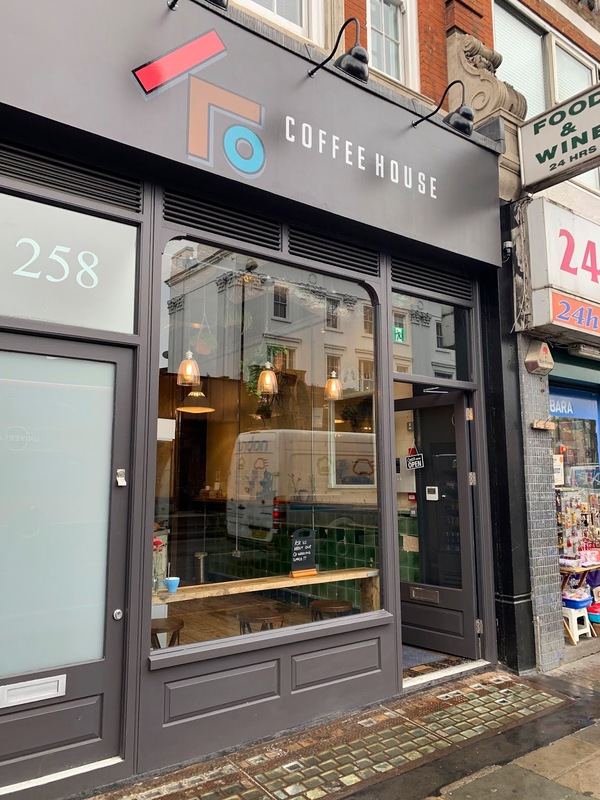 Just across the way was another roaster with striking packaging, the brand-new PLOT Roasting, based in Woolwich. I sampled a lovely Tanzanian Iyenga AB, which had juicy tropical fruit notes. 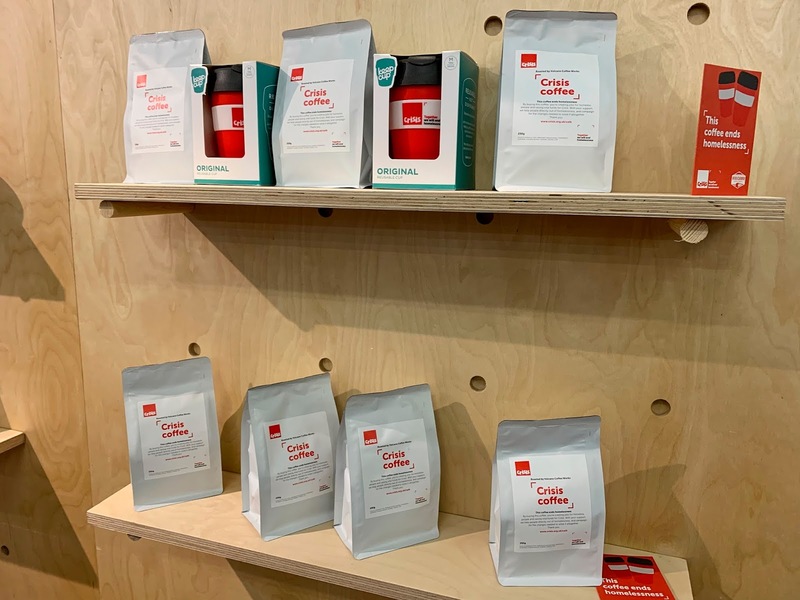 I also liked the bright, colourful packaging of ii Common, who have attempted to simplify coffee flavour profiles by describing each variety as either sweet, strong, bright or complex. Thanks to Brian of Brian's Coffee Spot for pointing me to Common (and also for the gift of some coffee from China, which I look forward to sampling). 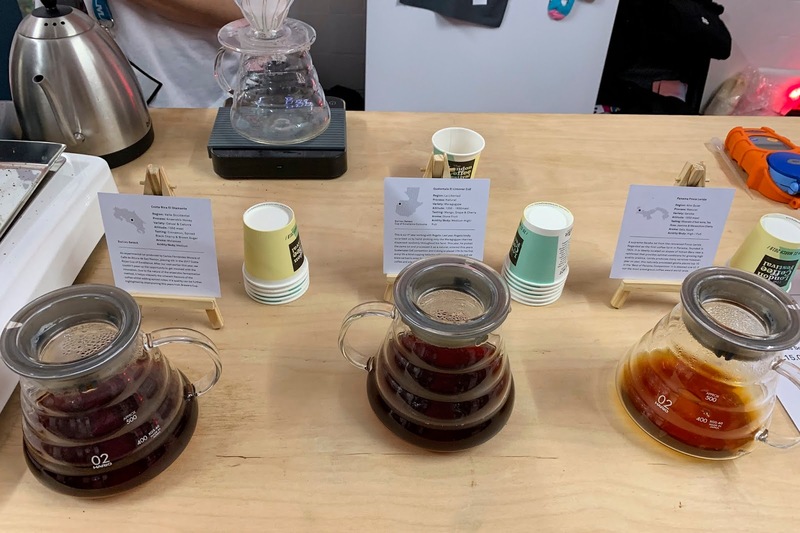 At the stand of Belgian roaster MOK, I enjoyed a peachy Ethiopian washed Wolichu Wachu filter coffee, and over at 39 Steps Coffee Haus, they had a fab Colombian Gesha, whose flavours came out beautifully as it cooled; it was worth the 10-minute queue to get to the coffee. 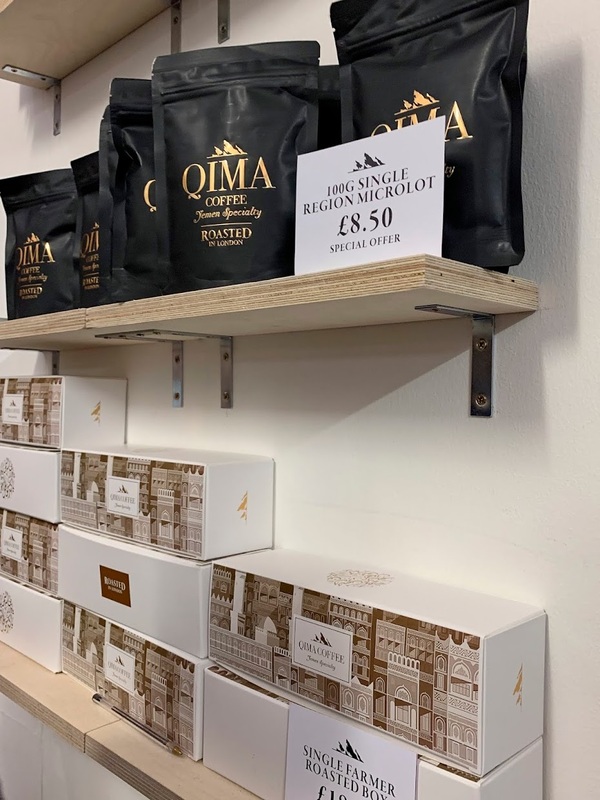 I was lucky that Phil Wain, Editor of Caffeine Magazine, gave me directions to the Qima Coffee stand because I had been struggling to find the London-based Yemen coffee specialist about which I had heard such good things. 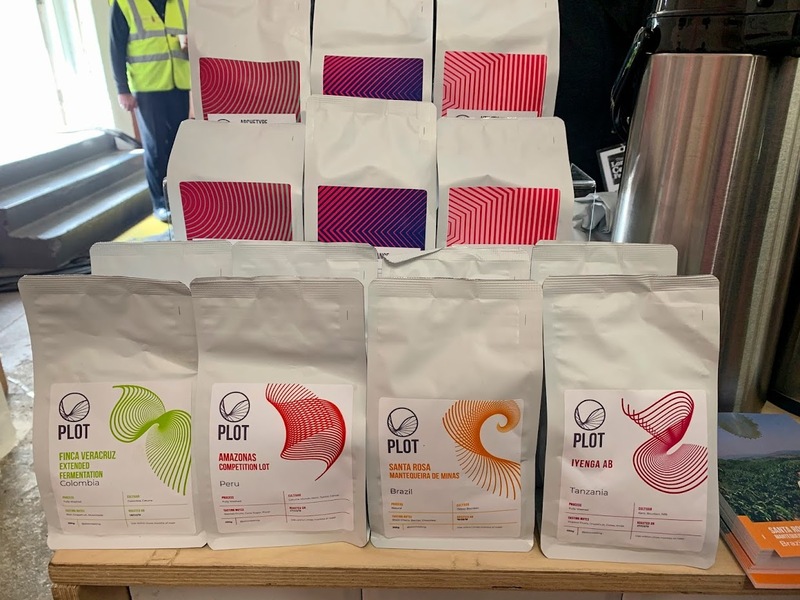 They were selling 100g bags of their single region microlot for £8.50 — a bargain, as it is a complex but delicious coffee. I also learned that they supply their green Yemeni coffee to Le Café Alan Ducasse in King's Cross. 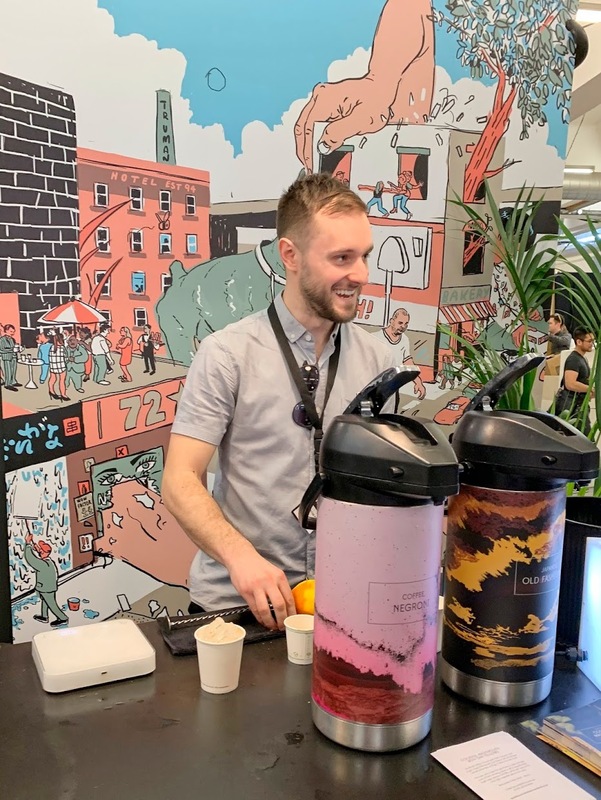 At Volcano's stand, I tried their Crisis Coffee, which, as part of Café from Crisis, is used to train people who are experiencing homeless in barista and service skills to help get them back to work. 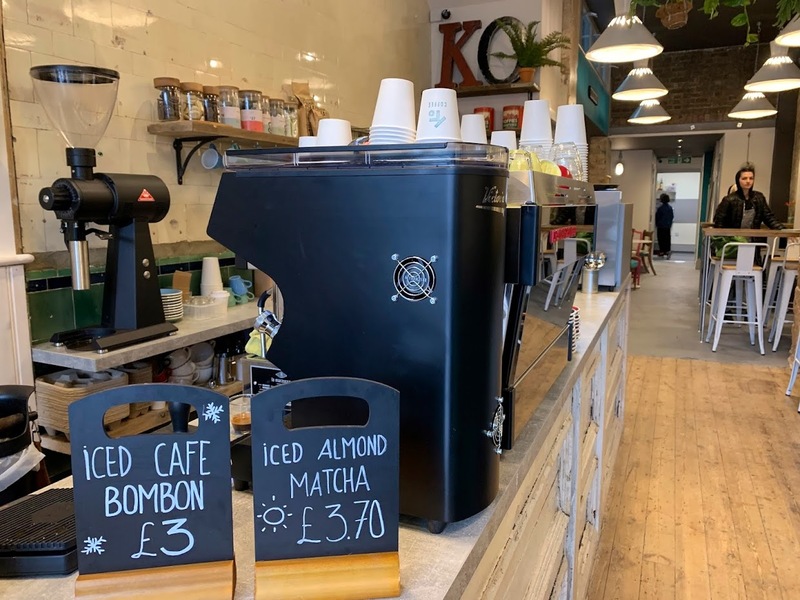 It's great to see that there are several initiatives that combine coffee and social enterprise in London now. I also enjoyed some delicious coffee from several of my favourite roasters. 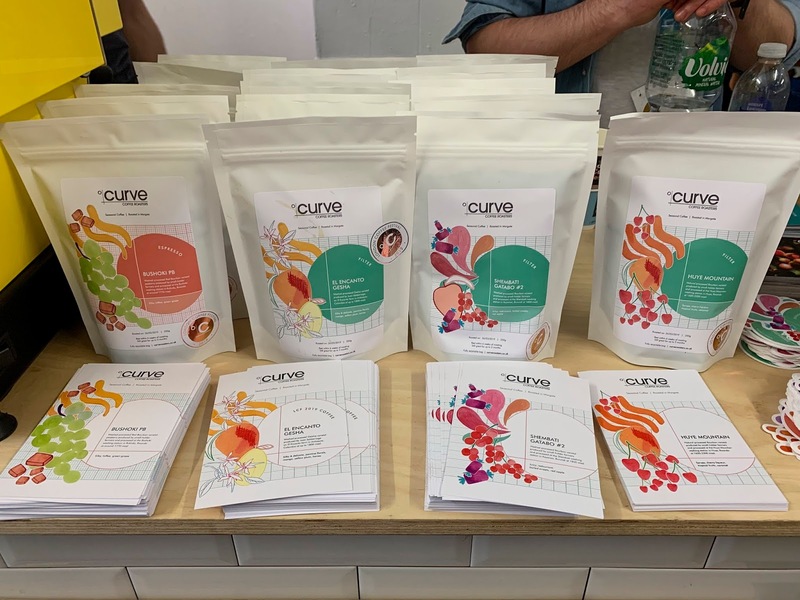 Curve, based in Margate, had launched some gorgeous, colourful new packaging and were serving a rather lovely Colombian Gesha, among other coffees. 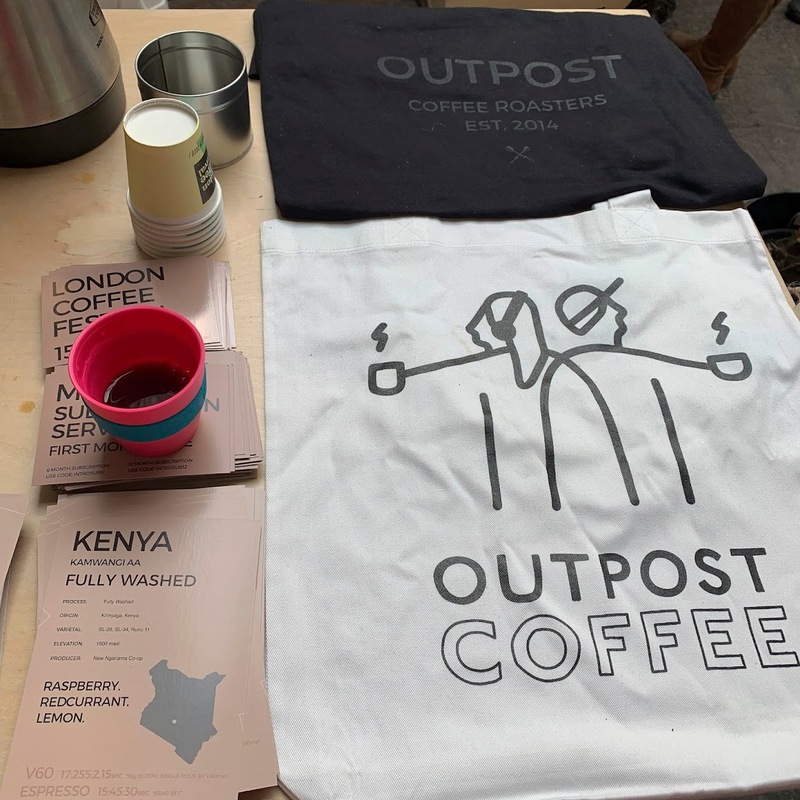 Over at Outpost, meanwhile, the Kenyan Kamwangi AA filter coffee had vibrant raspberry and redcurrant notes. And at Origin, they were selling a Panama Geisha, but I stuck to a coffee cocktail instead. Not just any coffee cocktail, but Dan Fellows' World Coffee in Good Spirits Championship-winning Japanese Old Fashioned cocktail, served by the man himself. 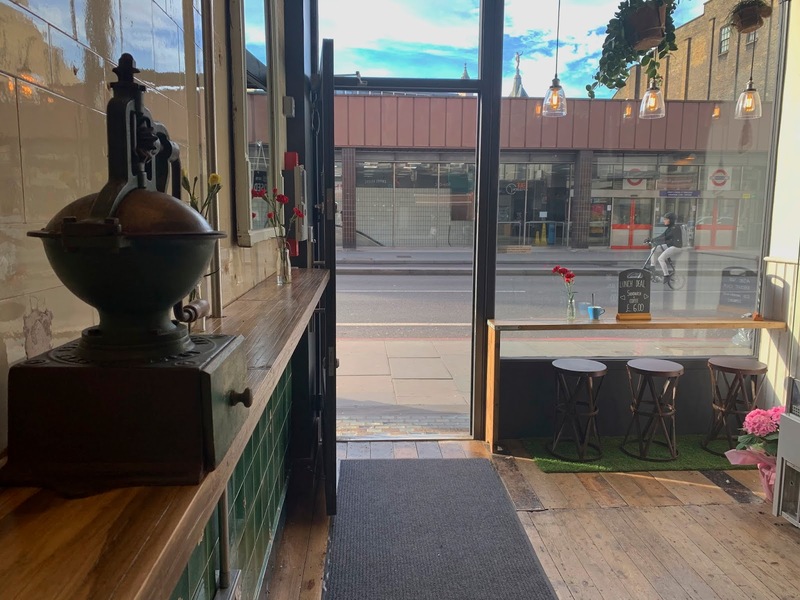 I also paid a visit to Grumpy Mule who last week launched a very special Yemeni natural-process coffee, which Dave Jameson kindly sent to me to try. 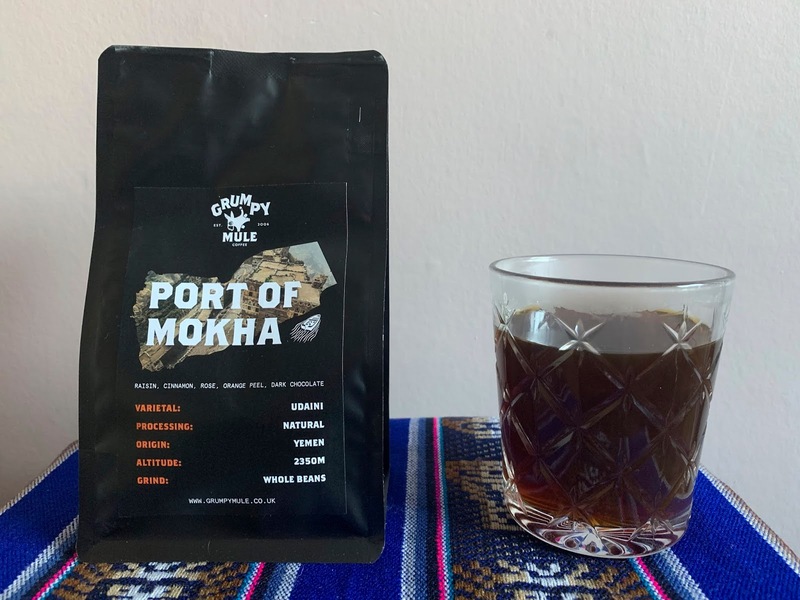 Grumpy Mule is the only UK roastery to showcase coffee from Mokhtar Alkhanshali's Port of Mokha this year, and the complex raisin, orange peel, cinnamon and milk chocolate notes came through beautifully when brewed in my Kalita. I'd been wanting to try Port of Mokha coffee since loving Dave Eggers' book The Monk of Mokha, and was so pleased I finally got the chance. You can get 15% and free shipping until 30 April 2019 on Grumpy Mule's website with the code GMPOM. 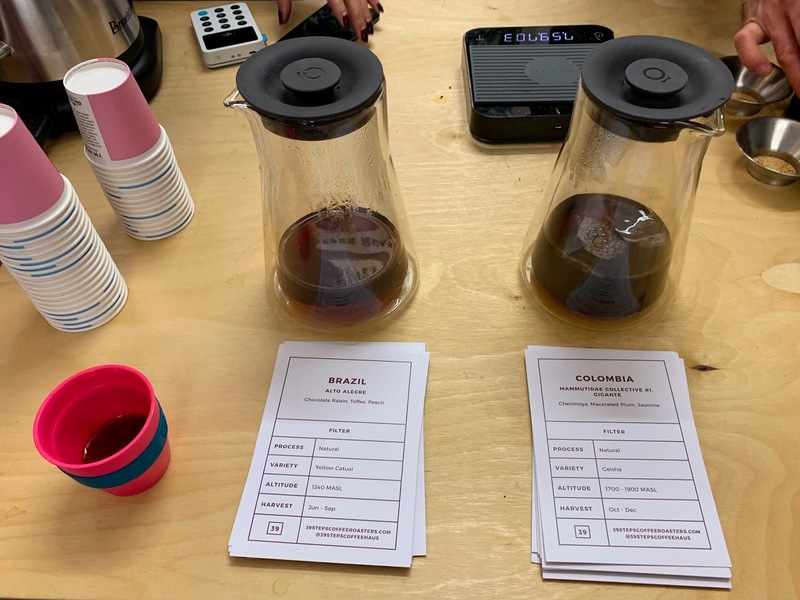 The Union Coffee team were running 15-minute 'flavour discovery' sessions, designed to help you to improve your palate — and heighten your awareness of tastes and aromas. We first got to take a little taste test, trying three waters that had been slightly flavoured with one of five basic sensations (sweet, sour and bitter, in this case). We then smelled several scented strips of paper and attempted to place them onto the flavour wheel — I did fairly well at this. 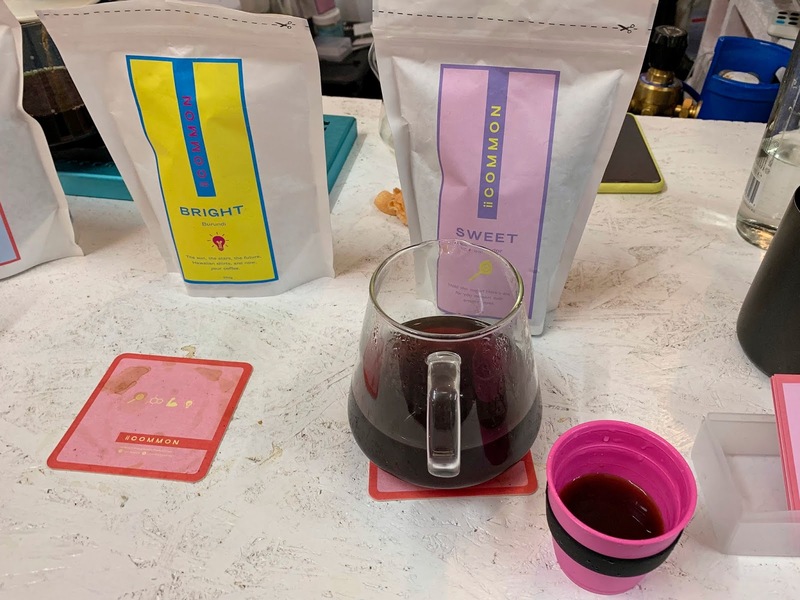 Finally, with our newfound sensory awareness, we smelled and then tasted two coffees and had to determine which had the chocolatey, nutty and cherry notes, and which was more citrusy. Using my nose alone pointed to the wrong answer, but once I tasted both, I was fairly confident in my answer. This year's festival also had a long overdue focus on efforts to cut down on the number of disposable cups. 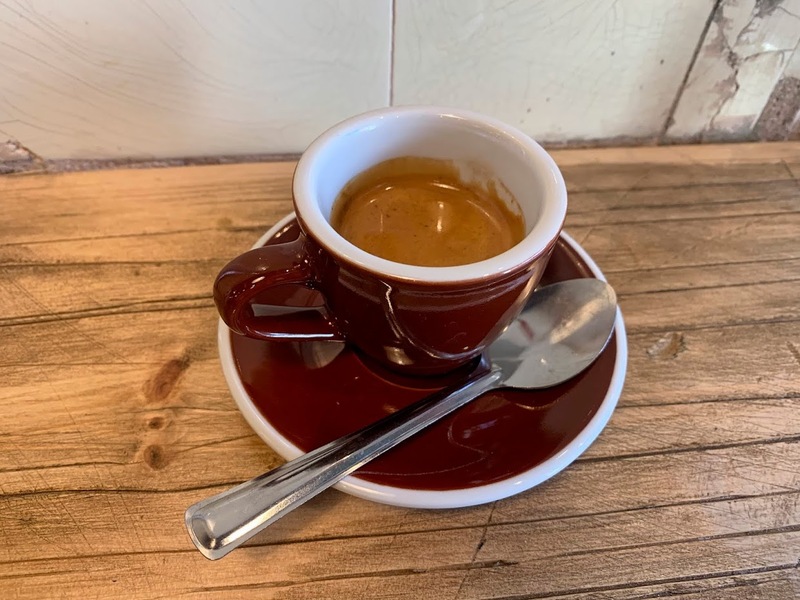 I brought two KeepCupsb with me — a 4 oz and an 8 oz — and tried to use them whenever I could, although occasionally, I wasn't fast enough to proffer my cup. There were a number of washing stations throughout the festival, and good recycling facilities, although — alas — still too many cups in the bin. 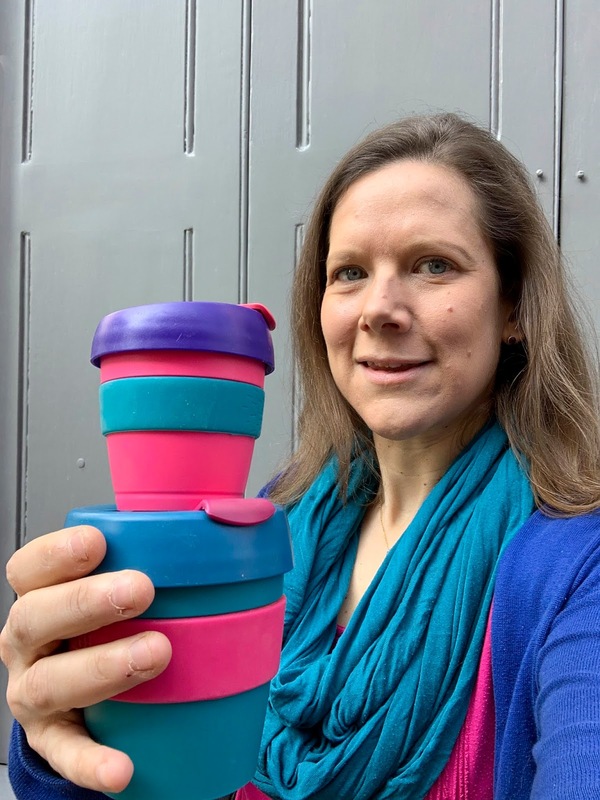 KeepCup and Best Coffee were running a reuse challenge, which prompted readers to take their reusable cup to various challenges and complete small tasks to receive a stamp. 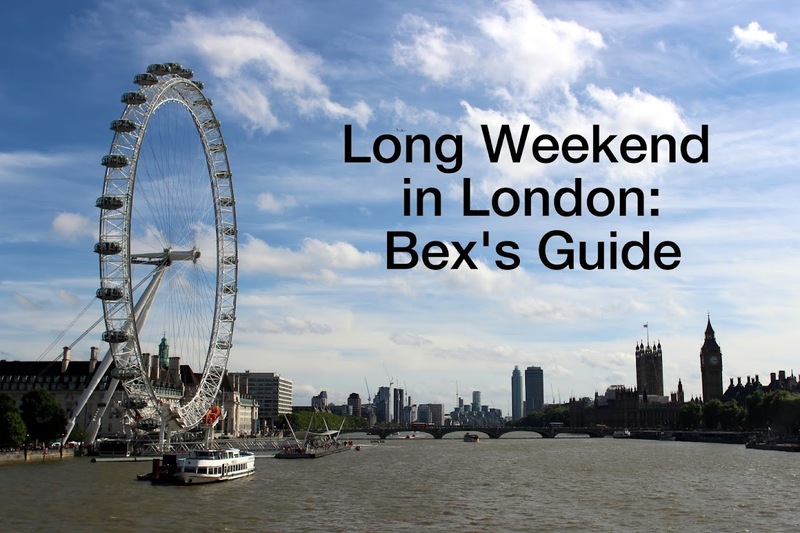 If you collected at least four stamps, you could enter a competition to win an eco-friendly weekend in London. Once again, I attended several sessions in The Lab, which hosts talks, panel discussions and interactive workshops. The location this year, on the top floor but in a rather noisy open-plan space, but the programme was great. 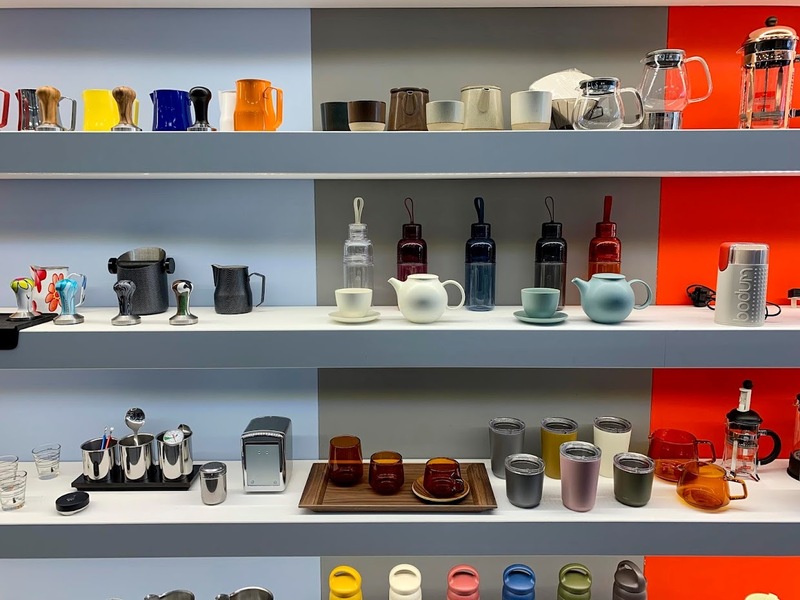 I heard a panel discussion about the rise of the home barista — and learned how much further down the speciality coffee rabbit hole I still have to fall (no home roaster yet!). 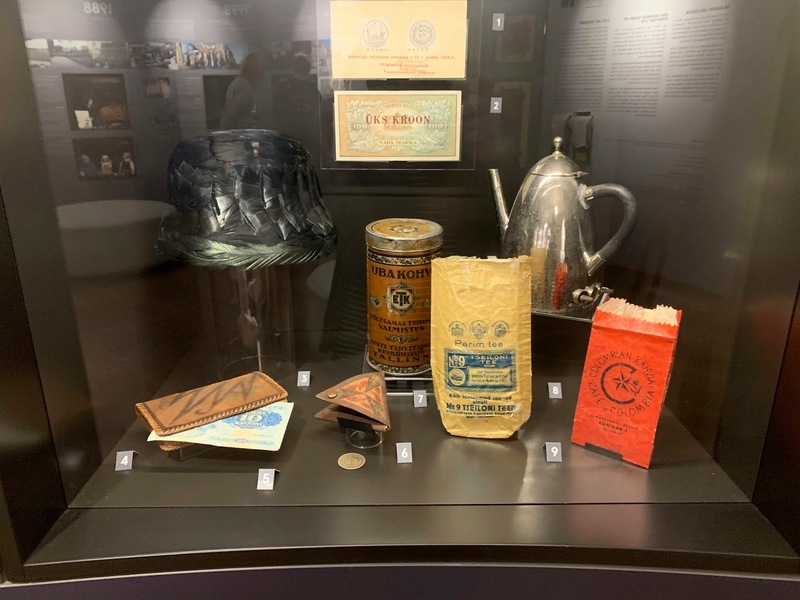 Later in the day, I listened to Professor Jonathan Morris from the University of Hertfordshire's informative talk about the five eras of coffee history. Jonathan was selling and signing copies of his book, Coffee: A Global History, which I look forward to reading. 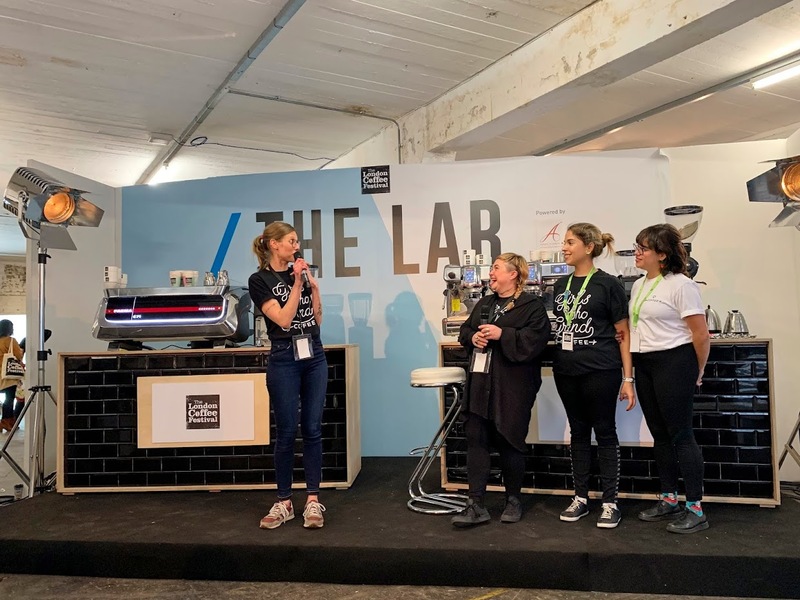 Finally, I went to an inspiring session with Fi O'Brien and Casey Lalonde, the titular Girls Who Grind Coffee, who spoke about the importance of promoting the role of women at every stage in the coffee industry, from farm to cup. They were joined by Daniella and Karla Boza from Finca San Antonio Amatepec in El Salvador, whose coffee is available via Girls Who Grind Coffee. Daniela talked about how her father had expected to pass his farm down to a son, but instead had three daughters who now run the farm. 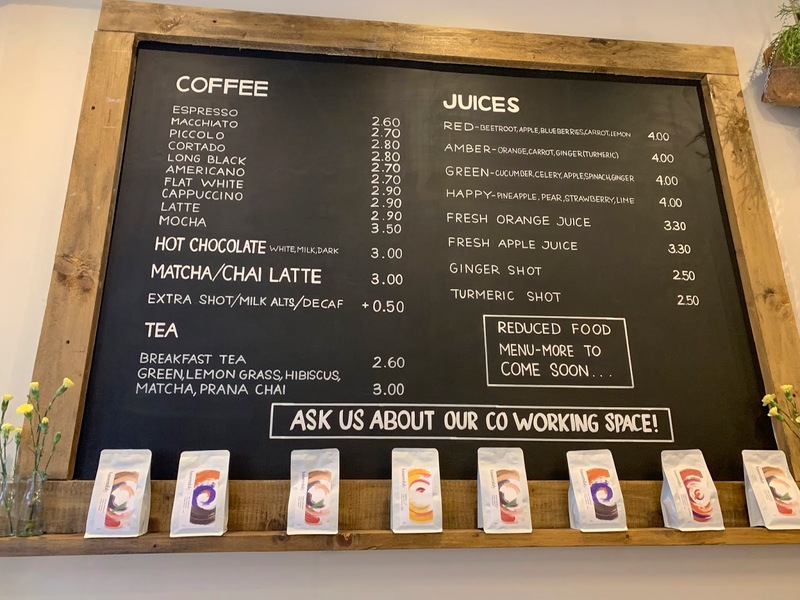 The connection the sisters now feel with those who drink their coffee is empowering, Daniela said, and the feedback they get is invaluable. Karla, meanwhile, talked about how they care for the thousands of trees on their farm (a former theme park!) as though they are their children. 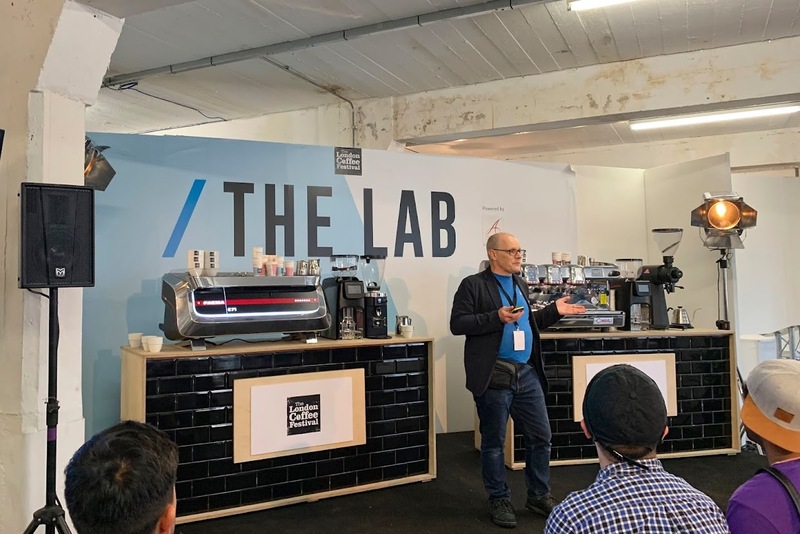 I also spent a little time watching sessions at the ever-popular Latte Art Live, in the hope that I will pick up some tips, and the Coffee Masters quarter finals. 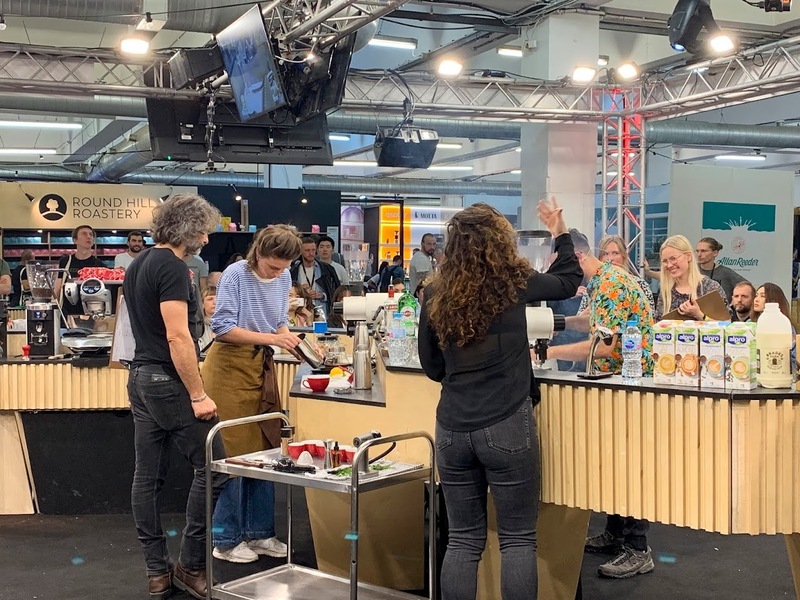 Whatever your thoughts on coffee competitions, watching some of the best and most passionate people in the business performing their craft always inspires me. For those who didn't bring a reusable cup with them, there were plenty of cups on sale at the festival. 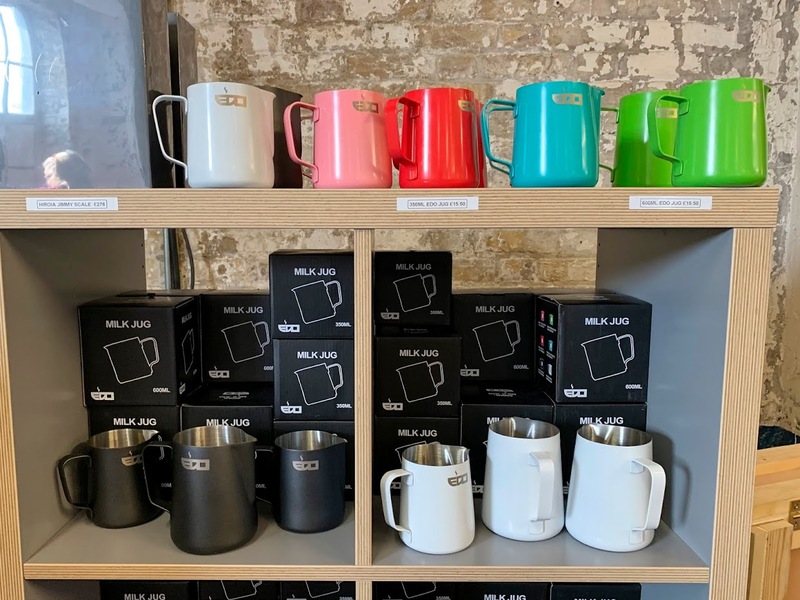 KeepCup's double-walled LongPlay cups were there, as were SoL Cups, who had a special London Coffee Festival edition. I had long had my eye on the HuskeeCup, and bought a sleek black 8 oz cup from the Origin stand. 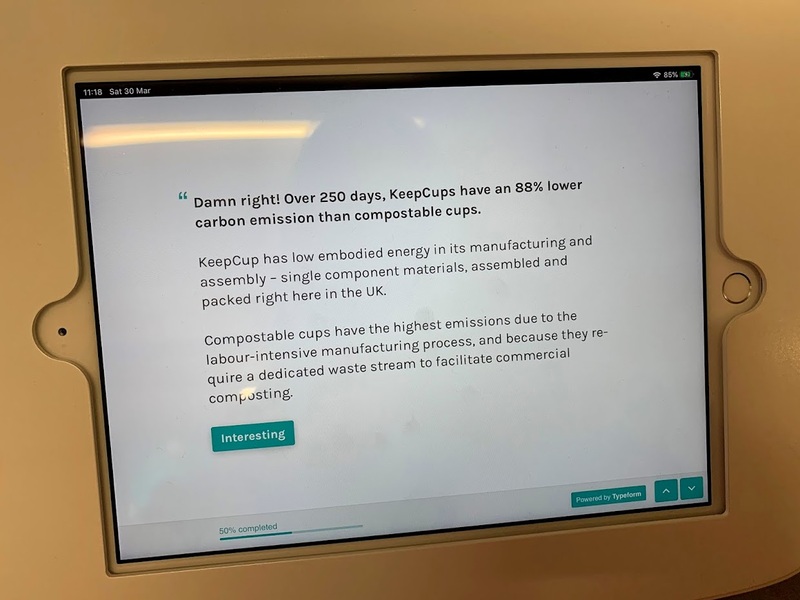 As its name suggests, the HuskeeCup is made from discarded coffee husk, and it's light, cool to hold and cool to look at. 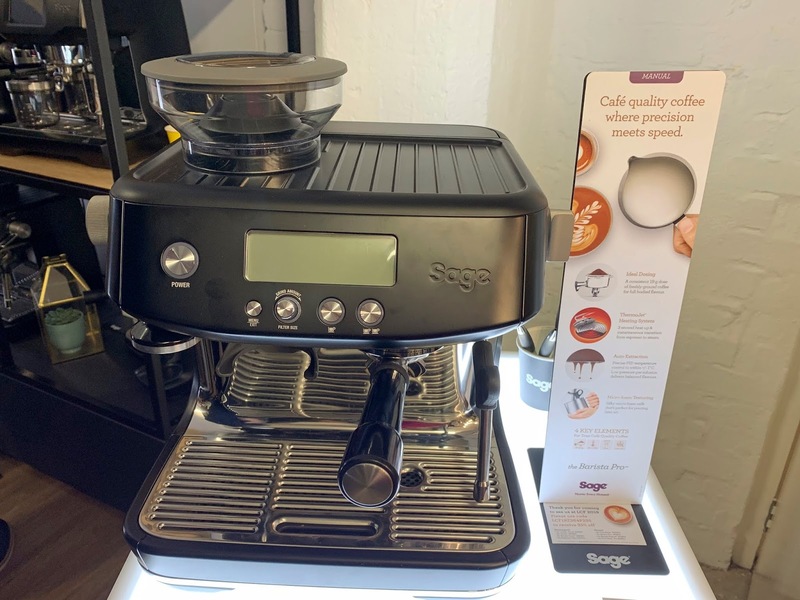 I now wish I'd also bought a 6 oz version for practising my latte art at home (they were the cups of choice during Latte Art Live); they will soon be available in Origin cafes. 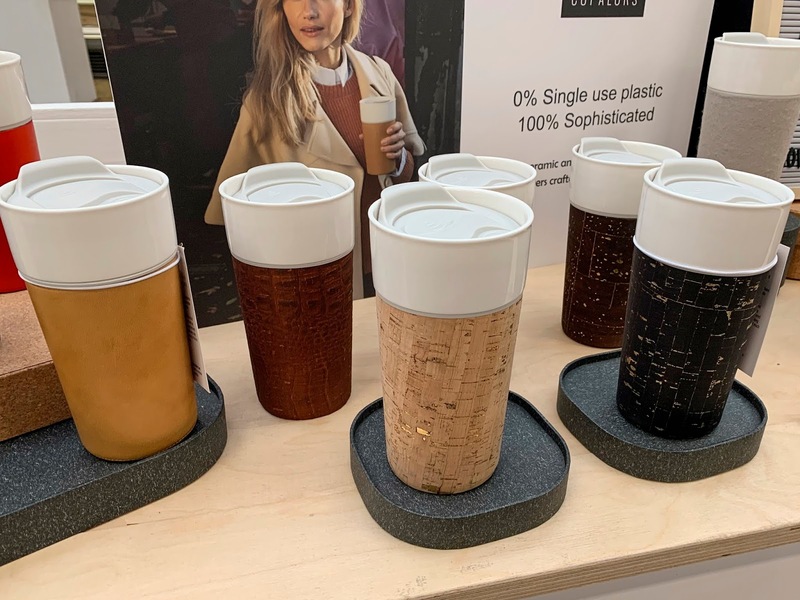 Some other cups that caught my eye were the Cupalors from France: ceramic and stainless steel travel mugs, with interchangeable cork, merino wool and leather cases. 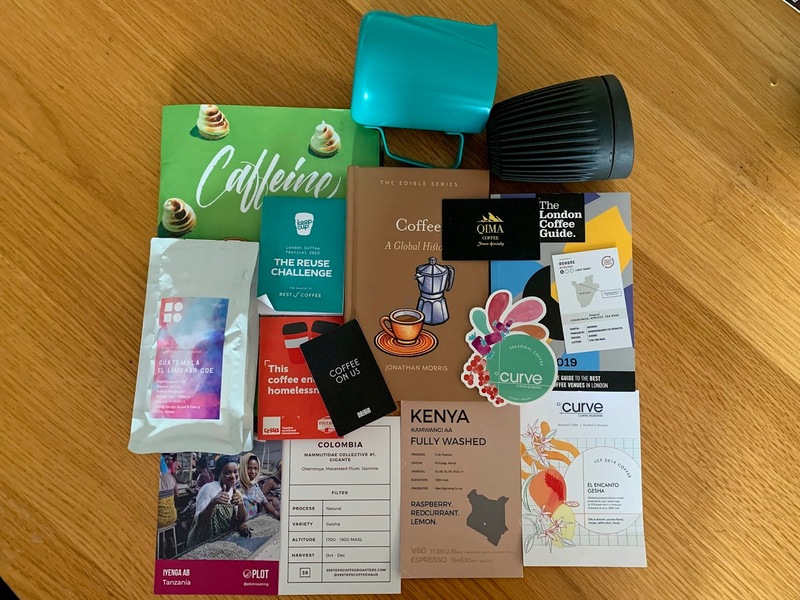 Here's what I came home with: some coffee, a mug, a jug, a couple of books, a magazine, and plenty of postcards to remind me of the great coffees I tasted so that when I am less overstocked, I remember which roasters to return to. Disclaimer: I attended this year's London Coffee Festival as press; thank you to the festival organisers and Hope & Glory. As always, all opinions are my own.